If you have any comments, or can supply more information regarding the photographs, please E-Mail the SSRA Website Manager. 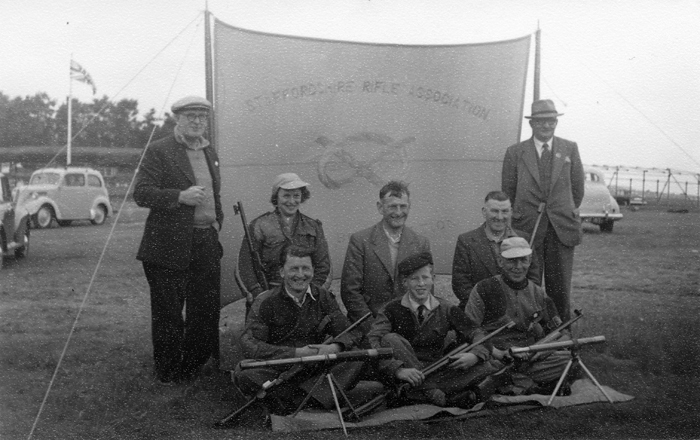 The above photograph shows members of the Staffordshire Smallbore Rifle Team, pictured at Bisley - possibly during the 1950's. If anyone can offer more information regarding the above photograph, or if any of the above details are incorrect, then please contact the SSRA website manager. 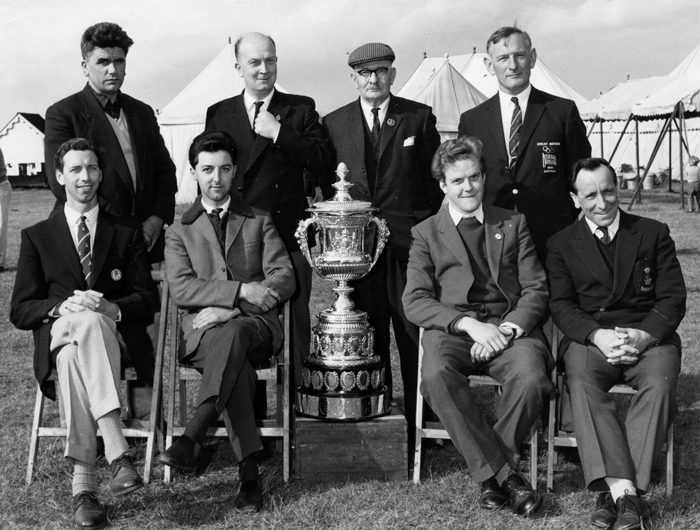 The above photograph shows members of the successful Staffordshire Smallbore Rifle Team, as they proudly display the Queen Alexandra Cup in 1964 at Bisley. Back Row (Left to Right): H.B. 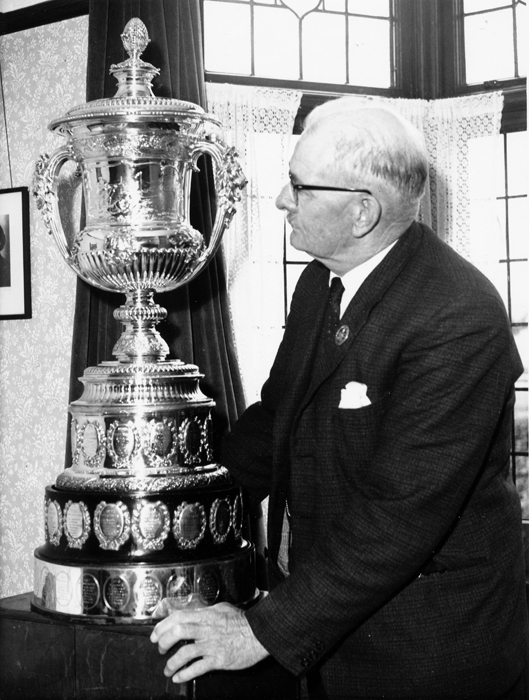 'Bert' Longden; Reg W. de Nicolas; Edward John Chipperfield; W.B. 'Bill' Godwin. Front Row (Left to Right): Neil Brown; John W. Fisher; Francis Owens; Frank Spittle. 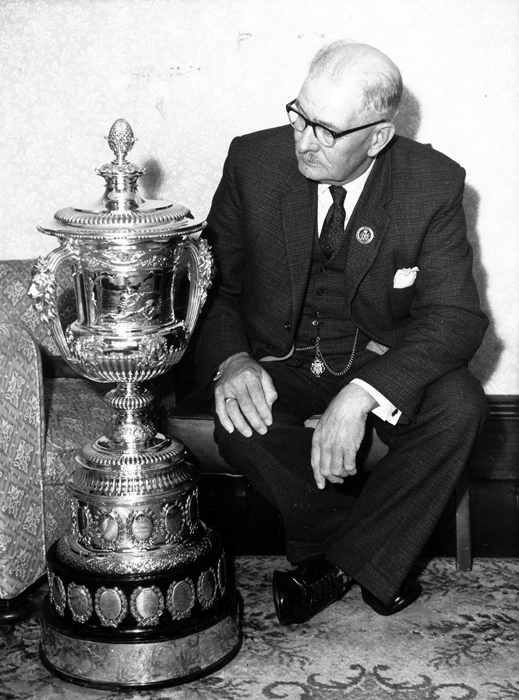 The above two photographs show Edward John Chipperfield admiring the Queen Alexandra Cup in 1964. 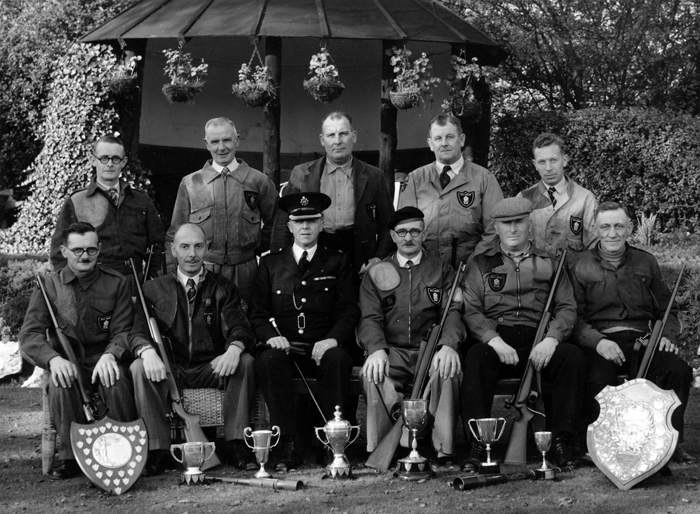 The above photograph shows members of the Newcastle-under-Lyme Police Rifle Club Team, proudly displaying a plethora of trophies. Edward John Chipperfield is pictured in the front row of the group wearing his beret. 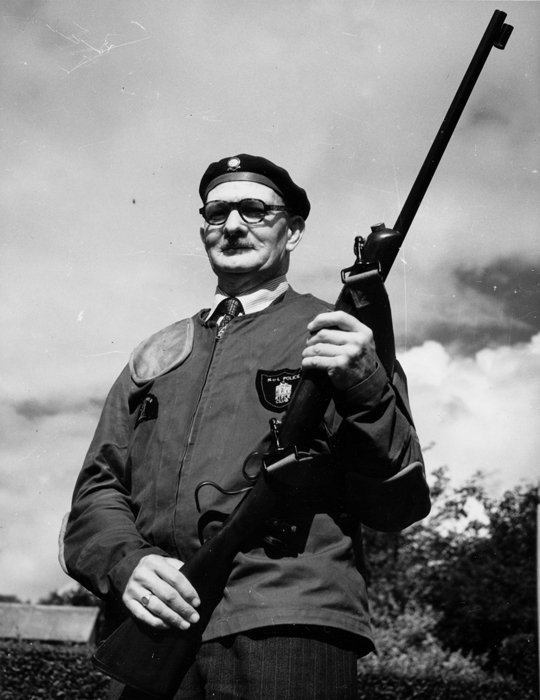 The above photograph shows Edward John Chipperfield with his trusty rifle. 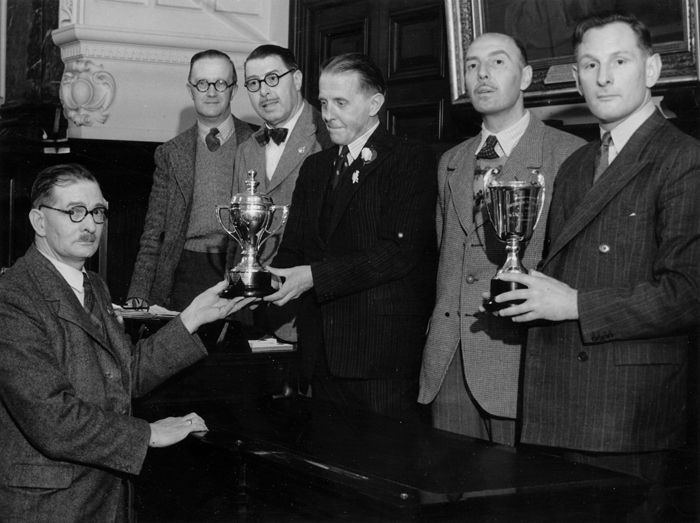 The above photograph shows Edward John Chipperfield presenting various trophies. 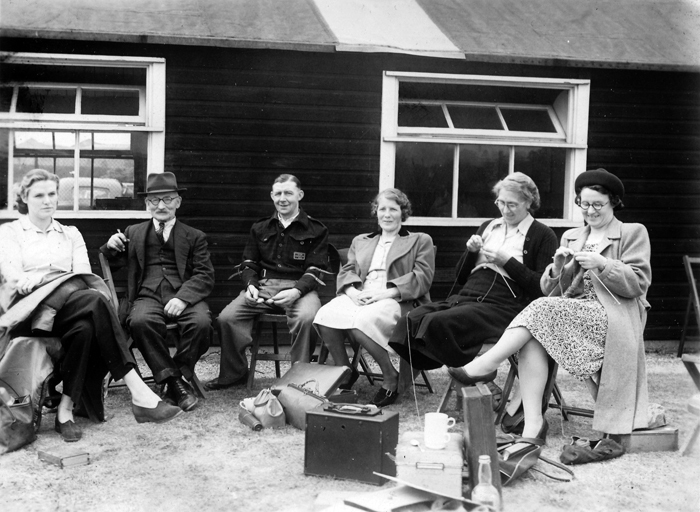 The above photograph shows the social side of a shooting club, as the ladies relax outside the clubhouse - knitting, nattering and relaxing, while the chaps take a break too. The above photograph was taken possibly at Birmingham Rifle Club, with E.J. Chipperfield relaxing, second left. More photographs from the collection appear on Edward John Chipperfield - A Selection of Photographs - Page 2.